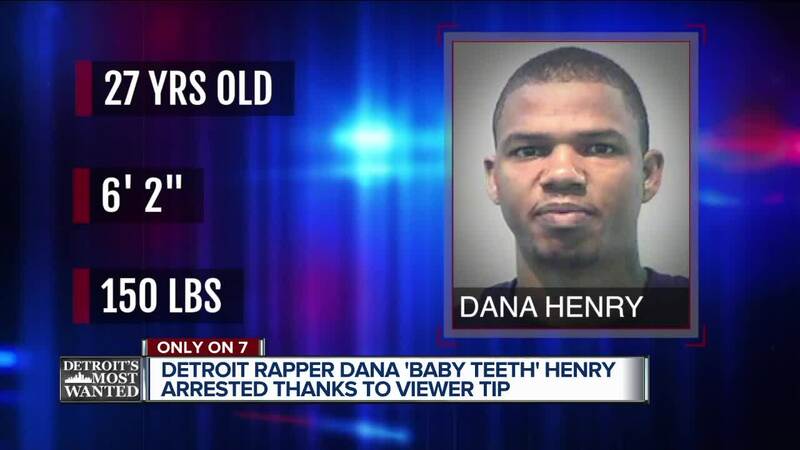 INKSTER, Mich. (WXYZ) — Dana Henry may have wanted to be famous, and now he is, but for all the wrong reasons. The 26-year-old aspiring rap artist is now under arrest after being featured in the latest Detroit's Most Wanted segment on 7 Action News Thursday . The U.S. Marshals and their partners that include Detroit Police, MSP, the Wayne County Sheriff, and officers with the Michigan Department of Corrections, surrounded a townhouse in Inkster late Friday morning after getting an anonymous tip from Crime Stoppers. A 7 Action News crew was there as officers surrounded the townhouse and ordered Henry to come out. And they had to be alert. "He's a runner," said one of the investigators. Henry was featured as Detroit's Most Wanted Thursday because he was wanted on an outstanding warrant stemming from the alleged is assault on his girlfriend with a hammer and a gun. "I didn't to that to nobody," Henry told 7 Action News reporter Kimberly Craig during his arrest. "I'm gonna be home soon." Shortly after the alleged assault in August, Henry skipped out on reporting to his probation officer, according to state records. He's on probation for a 2016 drug conviction. Click on the video to hear U.S. Marshals Assistant Chief Aaron Garcia talk about the critical role tipsters have in the effort to locate those wanted for serious crimes in the metro Detroit area.